We stumbled upon this scene while touring the Hulihee Palace in historic Kailua-Kona on the Big Island. The Hulihee Palace was a summer vacation home for Hawaiian royalty at one time and it is definitely worth a visit if you find some extra time on Ali’i Drive. Today, it is a museum run by an organization called the Daughters of Hawaii and it showcases some interesting artwork, artifacts and furnishings. These darling youngsters were getting an early start on hula lessons. I love that the Hawaiians have preserved and carried on this art form. It’s one of the first things that a mainlander is introduced to when they learn about Hawaii. And when you visit, you really do see that the hula is part of the Hawaiian culture and spirit of aloha. 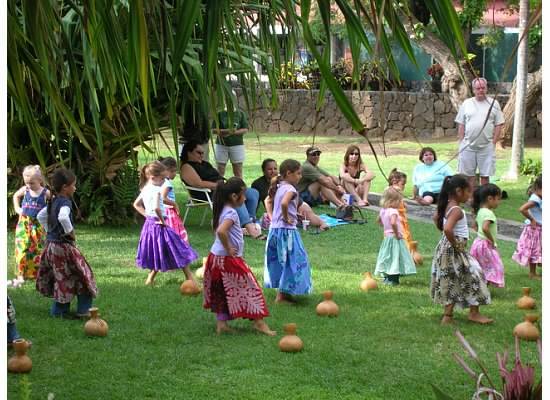 The sight of young children starting hula lessons at an early age made us smile. The hula has become an iconic symbol for all things Hawaii. It’s one more thing to love about Hawaii.